The story of Lisa and Lorraine appears in today's New York Times. I read the article last night and posted a link on my FB profile. Seeing this story in print in a major news paper like the New York time heartens me, Lorraine, and strengthens my resolve to do my part to change adoption in this country. In the face of all that adoption has cost me and my children, working for change is something that I can DO to change things for another woman and her child in the same predicament. I know that seems a bit of leap going from your story to this, but seeing you and your granddaughter empowered, I feel new breath in my own journey. So even though I don't know you or your granddaughter, thank you both for getting your story out there because it raises awareness for all of us who have been affected by adoption. 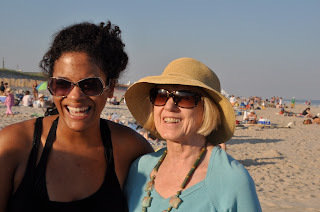 I read your granddaughter's blog regarding her visit and felt encouraged. She is clear about her feelings and respectful of herself and you, she is wise to let things develop over time and to allow you to do the same. I wish you both the very best and hope for your continued growth in your relationship with each other. Susan really did do a great job of conveying the appropriate tone and complicated feelings those of us separated from our family members endure. I also linked the article on my FB page. Thanks for all you do for us Lorraine! Adoption almost destroyed my spirit and almost ruined my life. I'm grateful you have the courage and stamina to want to educate people about adoption. Still really happy you have reunited with your granddaughter. I have finally found something to help me with my deep need to understand the feelings I and my daughter have towards each other. Even though it has been 16 years since she "found" me and we retain a close relationship, it is a roller coaster ride. Some days she barely will look at me, other days she hugs and holds me and tells me how much she loves me, I just feel so needy about wanting it to be always right but knowing that somewhere, way back in the dark recesses of my mind, I just have to accept whatever she is ready to give and there is nothing I can do about it. Just stay close, Just stay close, don't criticize, don't argue and maybe she will love me more. I gave birth in 1970 at the tender age of 17, only 11 months out of high school, traveling every day by bus to a new job in NYC. After hiding the pregnancy from my parents, friends and co-workers, all of whom I am sure were pointing fingers at me and laughing behind my back because they “knew”..for the entire 9 months. Feeling terror, anger, fear, regret, sorrow and shame, so much shame...fearing they would send me to a home for "unwed mothers" and hate me for ruining their lives. You cannot imagine the horrified, disbelieving faces of my two 30 something parents, staring at me from the foot of my hospital bed when they came to see me after the birth, called there by my best friend who came out in the dark of night to bring me to the hospital after I sneaked down the stairs to meet her in her waiting vehicle. I signed my daughter away on the 4th day, with much hate in my heart for myself knowing that there could be no life for her with me and my parents under the same roof, it would be brutal. I went through the next 25 years of my life, telling no one. not even the man I later married. Then one day in 1995 my phone rang one day, and it was "her" OH MY GOD!, my feelings of elation. I was bursting with joy. We met later that day and have been connected ever since. I never for one moment had a thought of not having her in my life, to hell with anyone who could not handle this news. And I told everyone in my life including my husband and his family… and oh yes, I am one of those women who never had another child. because in my heart, I didn't deserve to be a mother. My daughter is now a mother of three aged 6 and twins of 3. I moved closer to be near her and involved in their lives. we spend a lot of time together. Sadly my mother has refused to meet my daughter. How absolutely enraging this has been to me. My old fashioned mother, fearful of airing her "dirty laundry" or her "skeletons in the closet" My father is long gone but I believe that the birth of my daughter was the huge tear in their relationship so many years ago, my father not understanding how a "mother" could not see that her daughter was pregnant and my mother so angry that she was being held responsible by him for "letting" this happen. To this day my mother will not see my daughter and God knows I have tried. But I always bring over videos and pictures of them all to, I guess, push them in her face. hoping deep down that maybe someday the old woman will open her heart. Though we are connected in so many good ways, there are some very very tough days, weeks, months where I feel she cannot bear to look me straight in the eye. She is very happy to have a grandma for her kids and wants that. Her adoptive parents passed on 10 years ago, and I will say that it became easier to bond with her once her Mom died because I think her sense of betrayal lessened when her Mom wasn't there to feel perhaps abandoned by us reunion. She is a wonderful, bright, smart but complicated young woman...with some mental health issues that I truly believe are deeply rooted in the fact that she is an adopted child. something I can't change, can't take back and will probably spend the rest of my life trying to make up for. Lorraine, Great story by Susan. This is much needed publicity about the damage of adoption and the hope of reunion. A picture says more than a thousand words. Can't help but smile at the two of you on the beach. I remember that day so long ago when I first called you about Jane, and bringing Holly out to Sag Harbor to meet the two of you for the NYT article the summer of '83. Then, the problems, and your card telling me of Jane's death. You have both suffered much loss, and deserve every possible happiness. Hope your relationship grows. And the interruptions and fragmentation...I am divorced and my older child is now living with his dad, with whom he more closely identifies, and frankly, prefers...I believe that this scenario has everything to do with my being adopted, and the lack of entitlement and rootedness that goes with it. "Losing" my son has made me understand some of what my birthmother went through...and now I am hoping for a reunion with my own child.